Nikola Tesla was born at the stroke of midnight, July 9-10th, 1856, in Smiljan, Jugoslavia. His father was a distinguished clergyman, and his mother, Georgina Mandic, came from a long line of inventors. Dr. Tesla’s inventive genius was apparent from an early age; his education was received at various European universities where he studied the sciences and acquired knowledge of a dozen languages. In 1884 he came to the United States and became a citizen in 1889. He has always, and is now, engaged in independent experimental research. The inventions and discoveries of Dr. Tesla have been many and varied. Stated in chronological order, some of the more important ones are: The rotating magnetic field induction motor and alternating current system of power transmission, 1882-1888; Tesla coil and oscillation transformer, 1889-1892; electro-mechanical isochronous oscillators, 1890-1892; Tesla wireless system, 1891-1893; electron tubes, 1892-1893; theory of radioactivity, 1896-1898; high-potential vacuum tubes, 1896-1898; telautomatics, 1897-1899; discovery of terrestrial resonance and law of propagation of conduction currents through the globe, 1899; high-potential wireless transmitter, 1899; art of transmitting energy by stationary terrestrial waves, 1906; speedometers on new principles, means for lightning protection, types of steam and gas turbines, pressure and vacuum pumps and other apparatus, 1916-1926. Due to unfavorable circumstances, Dr. Tesla states, some of his important results have not yet been announced, among them being a new refining process for producing steel, copper, aluminum, and other metals at low cost. The knowledge of static electricity dates back to the earliest dawn of civilization but for ages it remained merely an interesting and mystifying phenomenon. Virtually nothing was done towards the development and useful application of the principle. The first distinct stimulus in this direction was given by the discoveries of Franklin and Leyden in the latter part of the 18th Century. In 1777 Cavallo devised a cylindrical friction machine and from that time on there was a slow but steady evolution of friction and influence machines until the modern Wimshurst, Holtz, Toepler, and other types were produced. Among these machines the one invented by Wommelsdorf 30 years ago was, probably, the most effective. 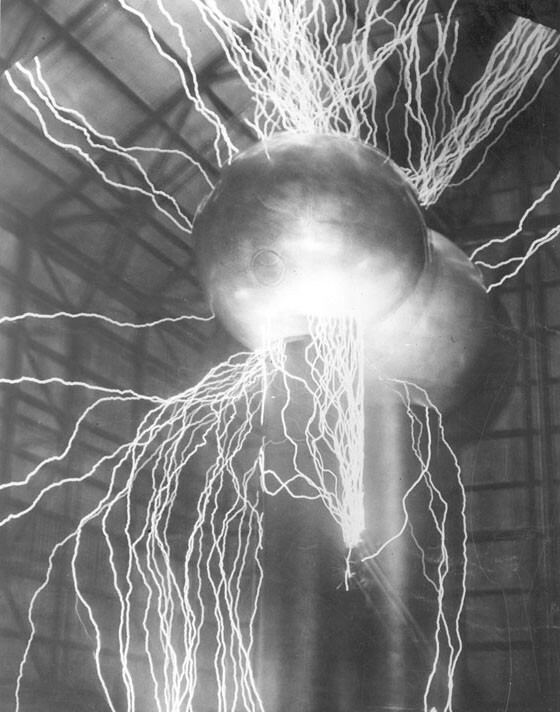 It yielded a current of six-tenths of a milli-ampere and in the present state of science it could be successfully employed for charging large aerial capacities and stepping up its terminal tension of 150,000 to many millions of volts. Numerous attempts have also been made to generate static electricity by friction of fluids and solid particles but from the earliest records to this day the belt has proved to be the simplest and most convenient means for the purpose. Static electricity from this source gained in importance when evidences accumulated that it was capable of interfering seriously with operations and causing accidents in paper factories, flour mills, and similar establishments. In the early nineties my electrodeless vacuum tubes became extremely popular and were frequently lighted from belts and later Roentgen tubes were operated in the same manner. It is quite easy to improvise such a generator and obtain interesting results under favorable atmospheric conditions. 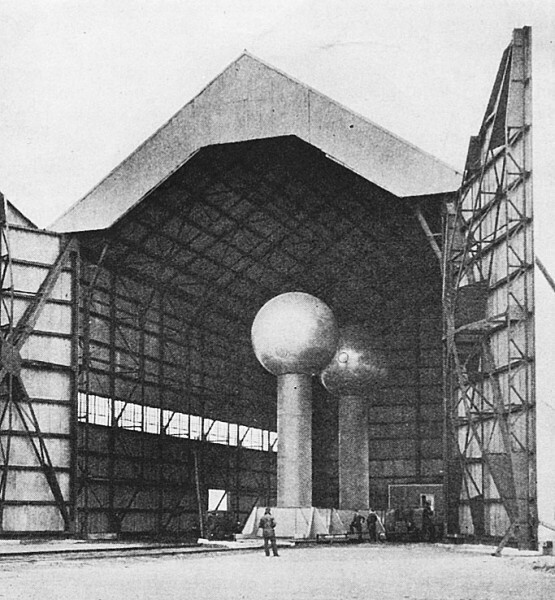 The Van de Graaff generator, shown housed in an aircraft hangar, is discussed by Dr. Tesla in the accompanying article. A remarkable device of this kind, embodying new features, has been recently developed by Dr. R. J. Van de Graaff at the Massachusetts Institute of Technology, and is attracting extraordinary attention. (See page 96, February, 1934, Scientific American. — Ed.) It is hailed as a revolutionary invention with which wonders will be achieved. The technical papers refer to it as a Colossus, a Master Key expected to unlock the secrets of nature. Naturally enough imaginative scribes have built Spanish castles on this foundation. So it comes that even such an ably edited paper as The New York Times informs its readers of a contemplated use of this generator for long distance transmission of power. According to a bona fide report in its issue of December 5, 1933, “the possibilities of the colossal generator have been worked out in theory and it now remains to apply it in practice.” However visionary this scheme may appear it is not absolutely impossible. A wise Macedonian king said: “No wall is so high that a mule loaded with gold could not jump over it.” With unlimited capital and regardless of returns, it might be carried out. In view of many articles and editorials written in the same vein, which have amazed the layman and amused the expert, it may not be amiss to examine the merits of this odd contrivance in the light of well demonstrated scientific facts. But first I want to point out an apparent discrepancy in the descriptive reports and photographs showing the apparatus in action, which is illustrated in the accompanying photographs, and consists of two aluminum spheres 15 feet in diameter supported on insulating columns six feet in diameter. Electricity is supplied to the spheres by paper belts charged from a “sprayer.” With terminals of such dimensions much higher voltages should be obtained. In most of the treatises it is assumed that the surface-density, that is, the quantity of electricity stored per square centimeter of a spherical conductor, can not exceed eight electrostatic units without break-down of the surrounding air. As a matter of fact the density can be pushed up to 20 units before power-consuming streamers appear. This being the case, the limiting voltage of a sphere having a diameter of 15 feet should be 16,964,700 and, consequently, the potential difference between two such oppositely charged spheres, very far apart, is 33,929,400 volts. It may be useful to state, however, that such large spheres placed at a distance of 55 feet between centers, as contemplated, will influence each other to a considerable extent, increasing their capacities. At this distance the increase will be about 16 percent, which should be taken into consideration when estimating the charge. The desired difference of potential could be obtained with much smaller spheres and it would seem preferable to employ them as they would yield sparks in quicker succession. Some of the photographs under the terminal pressure of 7,000,000 volts are puzzling because the surface-density in this case was only a little over 4 electrostatic units. Furthermore, sparks are shown to pass copiously along the insulating supports. This is a serious difficulty encountered in working with very high tensions but by properly shaping the under side of the sphere and resting it on a support well up in its interior, besides providing a liberal side clearance, the discharges are prevented from following the column and no further trouble is experienced even with the highest potentials. My wireless tower on Long Island, erected in 1902, carried a sphere which had a diameter of 67½ feet and was mounted in this manner. 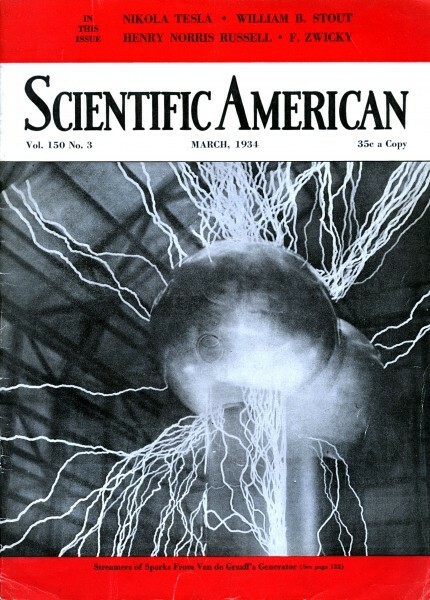 It was to be charged to 30,000,000 volts by a simple device for supplying static electricity and power. Most people, and not a few electricians, will think that very long and noisy sparks are indicative of great energy, which is far from being the case. An impressive display of this kind, at several million volts, can be readily obtained with any wide leather or fabric belt in dry weather. The only requirement is that the outward surfaces of the highly charged capacity elements be arranged along an ideal boundary everywhere of small curvature. But the electrical energy is trifling and this applies to all electrostatic generators which have been proposed, irrespective of size. One does not need be an expert to understand that a device of this kind is not a producer of electricity, like a dynamo, but merely a receiver or collector with amplifying qualities. All its energy is derived from electricity which is generated through friction or supplied by the sprayer and pumped into the terminals by the belts. 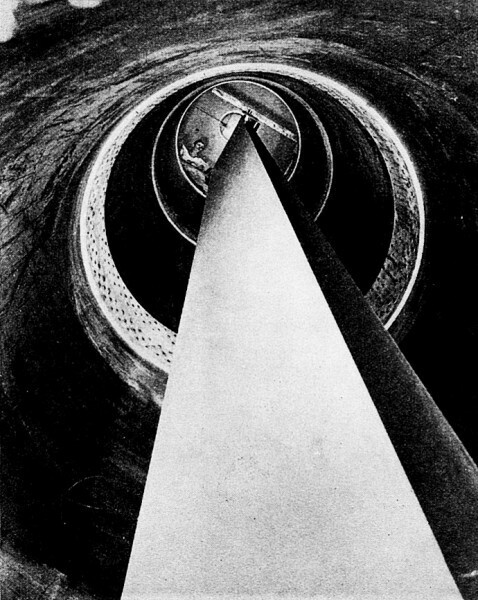 If the columns were as tall as the Empire State Building and the spheres 500 feet in diameter the monstrous machine could not have any more energy than is supplied to it by the electrified belts and no matter how much improved, this type is fatally doomed to small output and low efficiency on account of the existing limitations and the wastefulness of the process of conveying the charges from their sources to the terminals. controlling its size, voltage and possibilities, but give little hint regarding its mode of operation and power performance, I shall endeavor to advance the needed knowledge. With this object let it be assumed that the spheres are placed at a distance of 55 feet from center to center and that the potential difference between them is 10,000,000 volts. Ordinarily, the electric capacity of such a sphere is equal to its radius, namely 225 centimeters, but as before explained, 16 percent should be added to this, making 261 centimeters equivalent to 0.00029 microfarad. Consequently, when the regime is established, each sphere being at a potential of 5,000,000 volts, the electricity stored on each will be 0.00145 coulomb. If this quantity were supplied every second, the current would be 0.00145 ampere. An incandescent lamp of 25 watts requires a current 150 times more intense. In estimating the amount of electricity furnished to each terminal per second, only the sprayer need be considered as it supplies much more than could be generated by friction of the belts. The device used has not been clearly described but it is sufficient for the purpose of this dissertation to know that it operates at 20,000 volts and energizes, through rows of points, the two belts which are said to be four feet, or 120 centimeters, wide. Assuming that they are run at a speed of 100 feet or 3,000 centimeters per second, the area covered in this time interval would be 120 x 3,000 = 360,000 square centimeters. If it were possible to charge the belts uniformly to a surface density anything like that existing on an electrified particle, the output of the machine would be very great. But this can never be realized. The following approximate estimate will show what may be reasonably expected. The discharge of electricity from points has been extensively investigated and from the data available and my own observations I find that the current through each point at 20,000 volts will be about 0.0001655 ampere. No advantage would be gained by a very close spacing of the points on account of their mutual reaction but I shall make allowance for as great a number as seems practicable, say, 200, in which case the integral current would be 200 x 0.0001655 = 0.0331 ampere. Now, electricity is transferred from the points to the belt by minute bodily carriers — the molecules of the air. When such an electrified particle comes in contact with a large conducting body it gives up almost all of its charge to the same, but to an insulator, as the belt, it can impart only a very small portion owing to the strong repulsion between the charge deposited and that remaining on the particle. From theoretical considerations it appears that the part usefully applicable will, in all probability, not exceed 1/150 of the whole charge on any particle thrown against the belt. The current from the sprayer is 0.0331 ampere, that is to say, it conveys a total charge of 0.0331 coulomb per second and of this the belt will carry off only 0.00022 coulomb equivalent to a current of 0.00022 ampere. This means that 99.33 percent of the energy supplied by the sprayer is lost, and illustrates the appalling inefficiency of this method of electrification. As will be seen, the device delivers to each belt energy at the insignificant rate of 4.4 watts and is, therefore, virtually of no effect on the power output of the machine except that it imposes a limit to the same. This is important to remember in view of the general impression created by the earlier reports that all energy is drawn from the sprayer. Since the quantity of electricity stored on the spheres remains constant it is evident that the overflow current between them under normal working conditions must be 0.00022 ampere so that at the potential difference of 10,000,000 volts the machine should develop 2200 watts. As the supply from the exciter is entirely negligible the questions will be asked: Whence come energy and power? How is it produced? The answer is simple. It is derived from the belts which perform the work of transporting the charges imparted to them against the repulsion exerted by the spheres. This force can be approximately determined. The permanent charge on a sphere will be, as shown above, 0.00145 coulomb or 4,350, 000 electrostatic units. But 16 percent of this quantity is “bound” and should be left out of consideration. With due regard to the opening on the underside, the free capacity of each terminal may be estimated 222 centimeters, so that at five million volts Q = 222 x 5,000,000/300 = 3,700,000 electrostatic units. The moving charge will be distributed over a length of the belt about equal to the height of the insulating column and with some allowances it may be taken at 24 feet. Assuming a belt speed of 6,000 feet per minute this distance will be traversed in 0.24 of a second and, consequently, the belt charge to be considered is 0.24 of the whole carried per second; that is, 0.0000528 coulomb or 158,400 electrostatic units. The upper end of the charged area is 7½ feet and the lower 31 ½ feet from the center of the sphere. The former is thus r = 225 c.m. and the latter d = 945 c.m. The charged area of the belt being 120 x 720 = 86400 square c.m., it follows that the density of the charge is 158400/86400 = 1.8333 electrostatic units. Accordingly, if the distribution of the charge is perfectly uniform, a transversal strip of the belt one centimeter long will contain a quantity q = 120 x 1.8333 = 220 e.s.u. Another view of the high-voltage generator. Tracks are provided so the equipment may be rolled into the open. Considering now a surface element of vanishing length dx, the charge on the same will be qdx = 220 dx e.s. units of quantity and that on the sphere being Q = 3,7000,000 e.s. units, the repulsive force acting on the surface element at a distance x from the center of the sphere, will be Qq / x2 dx. Integrating this expression between the limits r and d, and substituting the values for Q and q, the force repelling the charged side of the belt is found to be F = Qq (d-r) / rd = 2,756,420 dynes or 2.81093 kilograms. At a speed of 100 feet or 30 meters per second the work is 84.3279 kilogram meters per second, equivalent to 0.82691 kilowatt. Both belts will therefore perform the work of 1.65382 kilowatts. This is 33 percent less than the theoretical electrical activity of the machine and as the power developed by the belts must be, at least, equal to the electric power one is apt to reach the conclusion that the sucking points do not draw off the entire charge, as has been tacitly assumed, and the current, instead of being 0.00022 will be proportionately smaller, that is, 0.0001654 ampere. But this view is found untenable for the limit to performance is imposed by natural law and not by the defects of a device which, moreover, could be readily improved. The discrepancy between the calculated power of the belts and the electric activity of the machine was all the more puzzling as the two quantities could not be harmonized by imagining any kind of theoretical working conditions. Finally, however, I recognized that the charge can not be uniformly distributed on the belt but must increase from the lower to the upper portion of the same. Indeed, such an effect might have been expected although the surface charge on an insulating body is not very mobile. Suppose that the belt carried a film of oil meeting with a downward current of air. The obvious result would be a thickening of the film toward the top. Similarly, the electric film on the belt is “thickened” through the repulsion exerted by the terminal and the attendant piling up of the charge and it is only so that the exact balance between the mechanical and electrical power can be, under all conditions, automatically established. (See explanatory note on page 165.) The equality of these two quantities is an absolute and inevitable consequence of the law of conservation of energy, the remarkable feature of this process of dynamo-electric transformation being that it is effected with the highest efficiency, apparently without evolution of heat. Of course, there are great losses in the operation of the machine, but they do not concern the process itself. In an instrument designed primarily for scientific investigation, the efficiency is of relatively small importance and I shall dwell on it for the sole purpose of showing that in any application as a power producer such a generator would be hopelessly handicapped. The air friction of the belts at a speed of 30 meters per second will require about 3.73 kilowatt. With the repulsion work, the load on them will be 5.93 kilowatt. Under the working conditions as outlined, the belt drive may have an efficiency of 90 percent and the motor 85 percent so that energy will be drawn from the electric mains at the rate of 7.75 kilowatt. The net performance of the sprayer at 20,000 volts will be 1.324 kilowatt but taking into account the efficiency of the whole apparatus, at least 1.6 kilowatt must be assumed. There are also dielectric, magnetic, and radiation losses, making the total power input, perhaps, 9.5 kilowatt while the output is only 2.2 kilowatt. If this estimate is reasonably approximate, an over-all efficiency of 23 percent is about as high as can be expected from any electrostatic generator of this kind. It was shown that the charge on each sphere at 5,000,000 volts is 0.00145 coulomb but as only 0.00022 coulomb can be furnished per second, it will take about 6.6 seconds to charge the spheres to the full potential. I have assumed that the current from the sprayer is continuous and not a rectified one, in which case the efficiency will be appreciably smaller. The streamers from pointed electrodes are generally considered as a sort of corona involving an insignificant loss of energy, but this view is erroneous. Such a discharge is very concentrated, approximating an arc in intensity, so much, in fact, that the heat evolved sometimes imposes a limit to the use of points. In the absence of a detailed description, the performance of this sensational generator can not be closely determined and the actual results may be different from those I have indicated, but not greatly so. While the energy supply may be increased by raising the tension of the sprayer and increasing the number of the discharging and sucking points, there are limitations in this respect and it is perfectly evident that, no matter how big, such a contrivance is nothing more than a toy compared with the commercial machines employed in the transformation and transmission of electrical energy. In view of this, and the low efficiency, its application will be confined to scientific experiments in which useful results may be achieved either by a feeble working current under high tension or by successive explosions. The latter method seems more promising because under proper conditions it is possible to discharge spheres in a time interval incomparably shorter than consumed in charging them and so amplify enormously the intensity of the actions. Any device depending on static electricity carried by a belt will fail in damp weather and will have to be operated in a closed space in which the air is properly conditioned. Also, the belts are apt to deteriorate rapidly through the action of ozone, nitrous and nitric acid produced by the point discharge. Although there is nothing radically new involved in the construction and working of this high voltage generator, it is, nevertheless, a distinct advance over its predecessors, the result of a scholarly effort towards producing an instrument suitable for scientific research. I think though, that whatever can be accomplished with it by virtue of the continuity of action, can be even better achieved by the use of cosmic rays. Moreover, the time consumed in the passage of a charged particle from one to the other end of the tube is so brief that it makes practically no difference whether the current is direct or alternating. In availing ourselves of the latter we are doing away with all the limitations as to voltage and strength of the current and, consequently, the intensity of the effects which it is the chief object to produce. 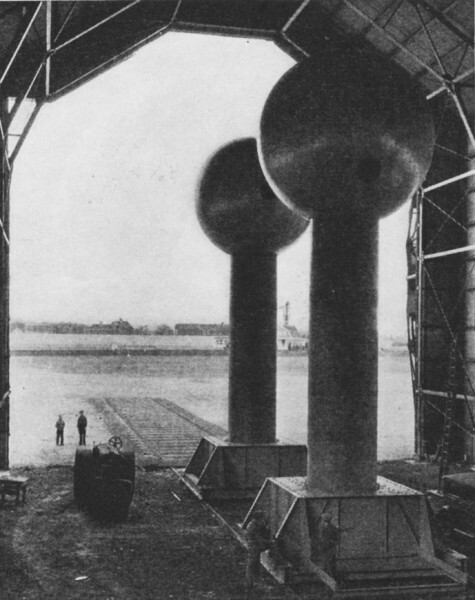 As far back as 1899 I made experiments with 18,000,000 volts and in some tests I was able to pass a current of 1100 amperes through the air. With my transformers a potential difference of 30,000,000 volts, or more, could be easily obtained and in the present state of the technical arts a tube or other device capable of taking up very great energy might be manufactured. I do not say this in disparagement of electrostatic generators; on the contrary, I believe that when new types are developed and sufficiently improved a great future will be assured to them. At first thought it might appear that the performance of such a generator could be doubled by using the free side of the belt for carrying away electricity of opposite sign. In this case the repulsion on one side of the belt would be balanced by the attraction on the other so that, theoretically, the spheres could be charged without expenditure of power. But this is contrary to fundamental laws of nature and it may, therefore, be safely inferred that such a plan would not work. Static electricity may be eventually harnessed for driving motors and this prospect is attractive on account of the enormous power output of such a machine at very high voltages. The efficient generation and control of these is the chief impediment in this direction. As an interesting experiment the two units of the generator described might be separated and so an electric drive improvised. It would be operative but inefficient. While it is quite evident that exceptionally favorable conditions for accurate observation will be realized in this instrument, it is highly probable that the attempts to smash the atomic nucleus and to transmute elements will yield results of doubtful value. Certainly, much of the ingenuity and skill now devoted to these illusionary tasks might be better employed. The nucleus is a neutral body consisting of tightly packed particles of the same kind which were originally positive and negative. When the body is smashed the particles again acquire their charges, without distinction, and instantly form neutral pairs so that we have nothing for our pains. It is folly to expect useful results from transmutation brought about through such bombarding of targets. If anything of considerable practical value is ever achieved in this direction it will be by the use of quasi-intelligent agent causing a sorting and regimentation of the particles and their orderly arrangement as required in the formation of a new structure. Such a power is possessed by a catalist and it will be eventually harnessed and controlled successfully for all sorts of purposes. Author’s note: Reference to page 134. The required increment of density can be determined by a simple calculation. At the spraying points, due to their constant action, there can be no change in the value 1.8333 found before, but from there on the density will increase and at the very top of the charged area it may be 1.8333 + a. Since the law of variation is quite immaterial to this argument it may be assumed that the increment is proportionate to the distance from the spraying points, especially as this is most likely to be the case. Under such conditions, a transversal strip of the belt one centimeter long and at a distance X from the center of the sphere, will contain a charge q = 120(1.8333 + a (d – x) / (d – r)) e.s.u. Hence the repelling force exerted by the charge Q on the terminal will be F = ∫rd Q x 120(1.8333 + a (((d – x) / (d – r)) (dx / x2))). This integral can be readily solved by expanding and yields the value F = 2756352 + 1088367a dynes. The mechanical work at the normal belt speed of 3000 centimeters per second will, consequently, be equivalent to W = 0.8269056 + 0.3265101a kilowatt seconds and must be equal to the electrical work of the machine with an overflow current of 0.00022 ampere under a tension of 5,000,000 volts; namely, 1.1 kilowatt seconds for each terminal so that a = (1.1 – 0.8269056) / 0.3265101 = 0.8364 electro-static units. With this excess density and distribution of the charge as set forth, the net power of both belts, expressed in electrical units, will be 2.2 kilowatts which is exactly the performance of the generator with the overflow current of 0.00022 ampere and terminal tension of 10,000,000 volts. It is evident that just as water finds its level so this balance is instantly established under all working conditions and is effected by a varying slip of the charge; that is to say, by reduction or increase of its translatory velocity according to the changes of the load.